Waste Management of Canada Corporation (WM) is undertaking an Environmental Assessment (EA) seeking approval for a new landfill footprint at the existing Ottawa Waste Management Facility (Ottawa WMF). 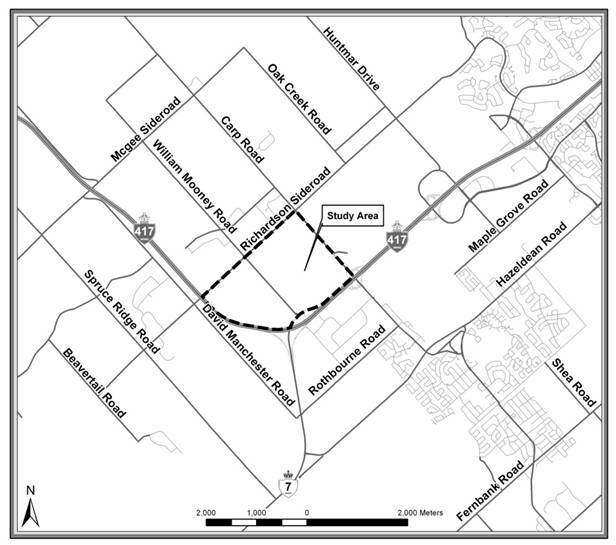 The new landfill footprint will be one component of the proposed West Carleton Environmental Centre (WCEC). Recreational lands for community uses. The new landfill footprint is the only component of the WCEC that requires EA approval under the Environmental Assessment Act (EAA). The proposed location of the WCEC and the new landfill footprint component is within the City of Ottawa in the area shown on the map below. The purpose of the EA is to study the potential environmental effects (positive or negative) of the proposed new landfill footprint. Key components of an EA include consultation with government agencies and the public; consideration and evaluation of alternatives; and the management of potential environmental effects. Conducting an EA promotes good environmental planning before decisions are made about a proposal. In November 2011, WM held a series of Open Houses and a Workshop with the public to review the final Existing Conditions, present the assessment and comparative evaluation of the Alternative Landfill Footprints, identify the Preferred Landfill Footprint, and present the five proposed Leachate Treatment Alternatives. The purpose of Open House #4 is to provide the public with an opportunity to review the Detailed Impact Assessment for the Preferred Landfill Footprint as well as the Comparative Evaluation of Leachate Treatment Alternatives and selection of a Preferred Alternative. In addition, WM will provide information about the ongoing EA process and related consultation activities. Material relevant to the current stage of the EA, including Detailed Impact Assessment reports, will be made available on the project website prior to Open House #4. These documents are intended to supplement the information that will be presented at Open House #4. In addition to attending the public open houses you are invited to submit your comments via the project website (http://wcec.wm.com), mail, email or fax to the addresses/numbers published below. We will also receive your comments on our project information line at (613) 836-8610. Please note that information related to this Study will be collected in accordance with the Freedom of Information and Protection of Privacy Act. With the exception of personal information, all comments received will become part of the public record and may be included in Study documentation prepared for public review.